LNMU Part 2 Result 2017 - Appeared in the 2nd year Examination of Lalit Narayan Mithila University, Darbhanga and looking for the LNMU 2nd Part Results ?? In this post, I am sharing each and every information you need to know about the Degree Second-year examination and the latest updates on results. LNMU Part 2 B.A, B.Com, B.Sc examination was held in the month of September 2017. The examination was held after University the revised examination routine after extending the firstly declared dates. Hons. and Voc. subjects examination were started from 11th of September and were closed on 19th September in 2 sittings. After Hons. examinations, the Subsidiary examinations were started from 22nd September to 2nd November. Practicals and Vivas were also conducted in November and December. You can check the detailed routine of Part 2 examination here. Every year, LNMU conducts the examination of UG Degree Part 2 examination and students from the colleges of all the 4 districts appear in the examination. Though they don't have any specific examination calendar yet but it usually held in the months of August-November. Now coming to the expected date of publishing of LNMU Part 2 B.A, B.Com, and B.Sc results, University generally takes 3-4 months in the declaration of the UG results. So, assuming that examination was held in November, students can expect their result in the month of February 2018. As of now, It's only an expected date. I am keeping a close eye on it and will update this section with each and every updates related to the results date. You don't need to worry about the recent updates and you can get all of them here at with no delay at all. University usually takes 3 or 4 months after the examination to publish the results with complete mark sheet. But still, they don't have any specific time for it. So, as we have been looking the various results of the past, It can be expected that candidates can have their results in February next year. Just after the announcement of results, Students can check their full marks on the official web portal of LNMU Darbhanga. Please note that IDR. no. or Roll no. will be required at the time of checking result. So, keep it handy to avoid any issues at that time. For your information, Marksheet of LNMU Degree Part 2 is available to download just after the declaration of results. So wait till the result goes live and this section will be updated will all the required links and resources to download the marks sheet. Here's a brief overview of the overall examination schedule and Expected date of results. This will be beneficial for you to keep an eye on schedule for references. Please Note - Website is going down again and again. So don't worry and try after sometimes. This section is especially for the recent updates and expected dates of LNMU Part 2 results. I will collect the information from various sources available to me and update this section with each and every single update I will have related to the results. All the latest updates and resources will be updated date wise and time to time as soon as there will be something new. Students are also recommended to check the official website of LNMU Darbhanga lnmu.ac.in for latest updates. You just have to check this section time to time to stay updated with the recent updates and announcements related to the LNMU UG Part 2 Results 2017. Update : 19 Dec, 2017 - As you know that Part 3 Examinations Dates are already declared by the University, so chances are high that results should be declared in the last week on January 2018. All the activities including Practical examinations are now done and there should not be any delay in the results because in February, Application forms will be filled for the final year examination. 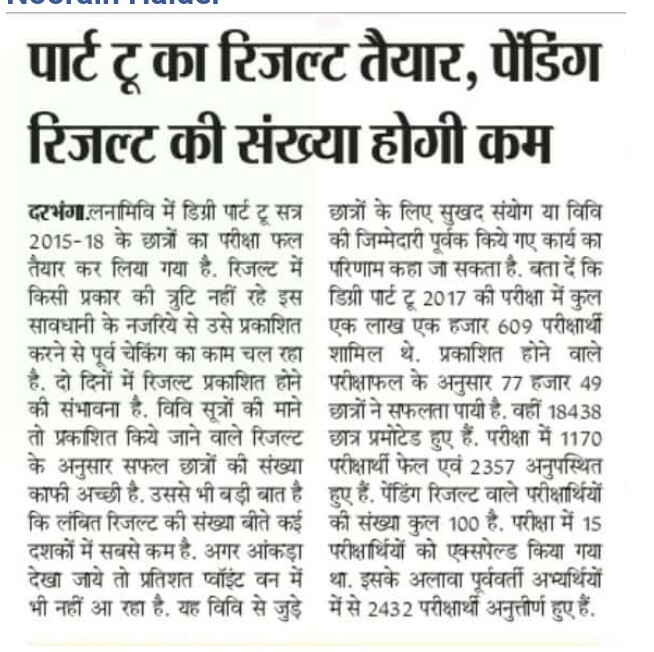 Update : 31 January, 2018 - In today's Prabhat Khabar Newspapers, a update is published. In this update, it is mentioned that the results are ready to be published. University is just revising the result so that there will be less errors. So, it can be expected that the results will be published within 5-6 days. Stay updated with s for more updates! Update : 2 Febraury, 2018 - Okay, So we have another update regarding the results. In local newspapers it is published that the Results are ready to be uploaded on the Website and from today's evening, it will be available on the web portal of University. Stay updated. As sson as it goes live, links will be updated here! Do you know how to check the results ? no ? As always, Results are expected to be declared on CPPResult.in. But don't worry, as soon as the results will be live on Internet, you will get all the informations regarding the website and required links right here in this section. Don't worry. 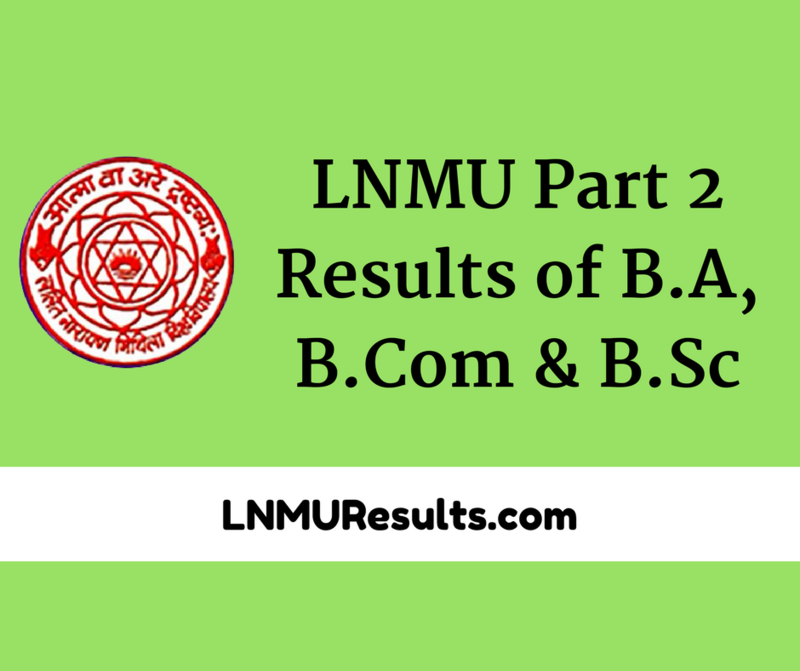 I will show you the complete steps to check your B.A, B.Com, B.Sc LNMU Part 2 Results 2017. Follow the below steps and you will be surely able to get your complete results with marksheet. Note - Please note that Roll no./I.D.R no. will be required to check your results as soon as it goes live. So keep it along with you handy. Then, Click on LNMU Part 2 Result option. A Pop up will appear and you will asked your Roll no. or I.D.R number there. Type your details and hit the submit button. As soon as you will hit the submit button, your result will be on your screen. Now feel free to download your marksheet and print it as per your choices. So that's all under the topic of LNMU UG Part 2 Result 2017. I will keep adding more and more updates to each and every part of this post as soon as there will be something new to know for the students. If you have any doubts, feel free to ask in the comments section and I will be happy to help you in checking your LNMU Results. B.Sc part 1 ka result kb ayega sir?